On 20 August 2015, North Korea launched artillery rounds into the mountains near a South Korean military base in the town of Yeoncheon, 60 kilometers north of Seoul. Pyongyang reportedly began the skirmish in response to official South Korean propaganda broadcasts from loudspeakers in the vicinity of the base. Seoul's troops responded by firing rounds from their own 155mm howitzers back across the border. No casualties were reported. Earlier in August, two South Korean troops were killed by land mines near the DMZ. Authorities in Seoul blamed North Korea for infiltrating across the boundary and planting the weapons. Pyongyang denied the accusations. North Korea's relationship with the South has informed much of its post-World War II history and still drives much of its foreign policy. North and South Korea have had a difficult and acrimonious relationship in the five decades since the Korean war. North Korea occupies the northern portion of a mountainous peninsula projecting southeast from China, between the Sea of Japan and the Yellow Sea. Japan lies east of the peninsula across the Sea of Japan. North Korea shares borders with the People's Republic of China along the Yalu River and with China and Russia along the Tumen River. According to north Korean defectors, Kim Il-Sung -- president of the Democratic People's Republic of Korea -- issued a sweeping order in the early 1970s that required every Korean People's Army division along the Demilitarized Zone to dig and maintain at least two tunnels into South Korea. 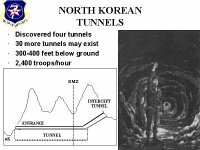 The opposing United Nations Command had been aware of an earlier north Korean tunneling effort that never became an actuality, but was surprised when new evidence came up that indicated the north was hard at work underground again. On the chilly morning of November 15, 1974, a ROK Army squad assigned DMZ civil police duties was on a routine patrol in the west-central sector of the DMZ when they noted steam rising from the ground. Hoping that had discovered a hot spring, they soon uncovered a shallow tunnel constructed 18 inches below the surface and extending 1,000 meters south from the MDL. Their exploration was halted by machine gun fire from a north Korean guard post. The patrol returned defensive fire to cover its retreat from the area. There were no casualties in the brief exchange -- the first ground clash between the two sides since March 1973. A probe of the tunnel revealed it was of recent construction complete with reinforced concrete slabs, electric power and lighting, weapons storage, sleeping areas and a narrow gauge railway with carts. Its size was about three feet by four feet and, though of undetermined length, the tunnel was estimated to be large enough to hide an infantry regiment -- or to funnel thousands of soldiers into the South in short order. On November 20, an enemy device exploded while a joint UNC/ROK investigation of the tunnel was underway, resulting in the death of U.S. Navy Commander Robert M. Ballinger and ROK Marine Corps Major Kim Hah Chul. Injured were six servicemen, five U.S. and one ROK. All were on an UNCMAC Joint Observer Team mission in which the north had refused to participate. The incident resulted in the first U.S. death in Korea attributed to the enemy since October 18, 1969. The UNC protested the presence of the tunnel at the 356th meeting of the Military Armistice Commission on November 26, 1974. The discovery alerted the UNC to watch out for other illegal tunnels that might be under construction. On March 19, 1975, the UNC announced that a tunnel-like cavity had been found in the southern portion of the DMZ, approximately eight miles northeast of Chorwon. Photographs from a bore-hole camera indicated the 170-foot subterranean excavation was clearly man-made. This was the second secret underground tunnel into the south to be discovered. Civilian engineers, assisted by UNC and ROK military personnel, dug a counter passage to allow further investigation. The interior proved to be some two meters high, a little less than two meters wide, and some 2,300 meters in length, of which about 1,000 yards extended into the UNC side of the truce zone. The UNC protested this violation at the 361st MAC on March 20, 1975. north Korea disclaimed any knowledge, claiming that if we had a tunnel, we must have dug it ourselves. On October 27, 1978, UNC disclosed that 10 days before, on October 17, it had confirmed another north Korean-built tunnel under the DMZ. The discovery was of particular interest because this tunnel was located only four kilometers from the Panmunjom truce village, along the main invasion route leading to the ROK capital of Seoul, only 26 miles south. The two-meter-by-two-meter interior could have accommodated passage by thousands of fully armed combat troops. The secret passage was the third confirmed since November 1974. U.S. and ROK teams continued to probe for additional tunnels. The UNC protested this violation at the 391st MAC on October 27, 1978. The north Koreans again disclaimed responsibility. On March 3, 1990, the ROK and U.S. combined forces found the north Korean's fourth invasion tunnel about 261km northeast of Yanggu in Kangwon-do Province. The location of this tunnel, the first to be found in the Eastern Sector of the Demilitarized Zone, clearly indicates that north Korea has dug invasion tunnels (estimated total well over 20) along the entire stretch of the front line. This tunnel was buried 145 meters below ground and measured 2 meters high and 2 meters wide, large enough for three armed soldiers to run through side-by- side. 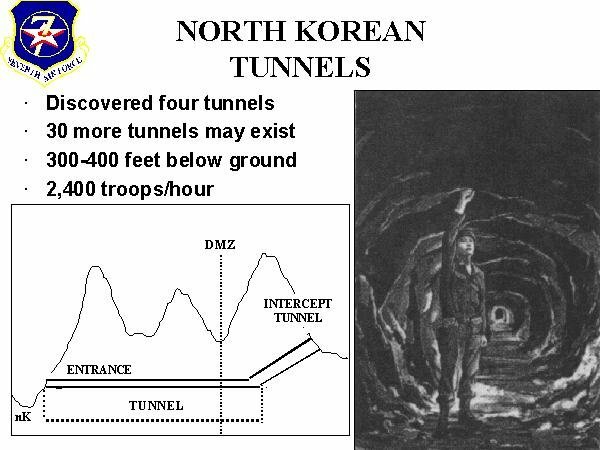 On March 9, 1990, north Korea, for the first time, admitted in a propaganda broadcast in the DMZ that they dug the fourth tunnel. They claimed that the purpose of this tunnel was to "facilitate peaceful reunification" by "replacing the concrete wall" that the north falsely alleges the South built. The UNC protested this act of provocation and blatant violation of the Armistice Agreement at the 455th MAC meeting held March 14, 1990. At 6:10 AM July 17, 2003 North and South Korean soldiers echanged machine-gun fire near Yonchon, 35 miles north of Seoul. The North Koreans fired four 14.6mm rounds from a distance of 1,100 meters at ROKA soldiers who responded with 17 shots from a K-3. Warning announcements were made on the ROKA loudspeaker. ROKA soldiers along the DMZ were put on alert. Three of the four DPRK rounds struck a ROKA guard post. No ROKA casualties were reported. On 10 August 2014, North and South Korean troops exchanged machine gun fire across the DMZ. North Korea troops reportedly started the skirmish in protest over private South Korean citizens floating balloons across the border to disperse propaganda leaflets.